The Asian barred owlet (Glaucidium cuculoides) belongs to the family of true owls and owlets, Strigidae. The Asian barred owlet species are distributed in India, Pakistan, Nepal, Bhutan, Bangladesh, China, Myanmar, Thailand, Cambodia, Laos and Vietnam. These owlet species do not have ear-tufts. These owlets are polytypic species. The Asian barred owlet (Glaucidium cuculoides) is a fairly large owlet, measuring 20 to 25 cm in length and weighing 150 to 180 grams. The adult Asian barred owlet has grayish brown head with buff barring. The upperparts are rufous brown with buff barring. They lack ear-tufts. There is a broken white line at the edge of scapulars. There is a white chin stripe. The facial disc is diffuse. The underparts of the Asian barred owlet are brownish. The pale buff barring on the belly and flanks is broken by white patches. The tail is brown and has pale buff bands. The tip of the tail feathers is whitish. The juveniles have buff spotting on the crown, nape and mantle. The barring on the breast and flanks is diffuse. The bill of the Asian barred owlet is pale green with pale yellow tip. The irises are yellow. The feet are greenish yellow. Their call is a rapid trill descending in pitch and also a series of squawking sounds. These Asian barred owlet species are distributed in India, Pakistan, Nepal, Bhutan, Bangladesh, China, Myanmar, Thailand, Cambodia, Laos and Vietnam. In India, these Asian barred owlet species are distributed in the states of Jammu and Kashmir, Himachal Pradesh, Punjab, Haryana, Uttarakhand, Sikkim, West Bengal, Assam, Meghalaya, Arunachal Pradesh, Nagaland, Manipur, Tripura and Mizoram. The Asian barred owlet nominate subspecies G. c. cuculoides is distributed in northeastern Pakistan, northwestern India (Jammu and Kashmir, Himachal Pradesh, Punjab, Haryana, Uttarakhand), Nepal and western Sikkim (India). The owlet subspecies G. c. austerum is distributed in eastern Sikkim (India), Bhutan, northeast Assam (India), southeast Tibet and northwest Myanmar. The subspecies G. c. persimile is distributed in Hainan (China). The Asian barred owlet subspecies G. c. rufescens is distributed in Bangladesh, northeastern India, southern China and northern Myanmar. The Asian barred owlet subspecies G. c. whiteleyi occurs in northeast Vietnam and west, central and southeast China. The Asian barred owlet subspecies G. c. bruegeli is distributed in southern Myanmar and southern Thailand. The subspecies G. c. delacouri occurs in northeast Laos and central Vietnam. The subspecies G. c. deignani occurs in southeast Thailand, Cambodia and southern Vietnam. These Asian barred owlet species have moderate forest dependence. They normally occur in altitudes from 0 to 2700 meters. Their artificial ecosystems and habitats include rural gardens, orchards and plantations. The natural ecosystems and habitats of these Asian barred owlet species include open oak and pine forests, tropical and subtropical moist lowland forests, evergreen forests, temperate forests, moist montane forests and moist shrublands. The diet of Asian barred owlet consists mainly of large insects. Beetles, grasshoppers, crickets, mantids, locust, cicadas and termites are their primary food. These Asian barred owlets are known to prey on frogs, lizards, rodents and small birds. They catch their prey in flight. Occasionally, they forage on the ground or glean their prey from the foliage and branches of trees. The breeding season of the Asian barred owlet species is during April and May in India. The laying season is from April to June in Nepal. They are monogamous and territorial. The nesting sites of these owlet species include tree cavities and old woodpecker holes. The clutch may contain four to seven eggs. The female does most of incubation and the male feeds the female. The Asian barred owlet chicks hatch out in four weeks. The female broods the chicks for a week and the male provides food. Later both the parents feed and care for the young. The nestlings fledge 30 to 34 days after hatching. These Asian barred owlet species are non-migratory, resident birds. The birds in higher altitudes move to lower levels and plains during winter. Post breeding, the juvenile owlets may disperse and establish in new locations within the range. They may make local movements for feeding and breeding within their range. The global population size of the Asian barred owlet (Glaucidium cuculoides) has not been quantified. The overall population trend of these species is considered to be increasing. Throughout its range, this owlet species is reported to be common. The generation length is 3.8 years. Its distribution size is about 8,500,000 sq.km. Habitat alteration and destruction, deforestation and capture for pet-trade are the main threats that may endanger the survival of these owlet species. 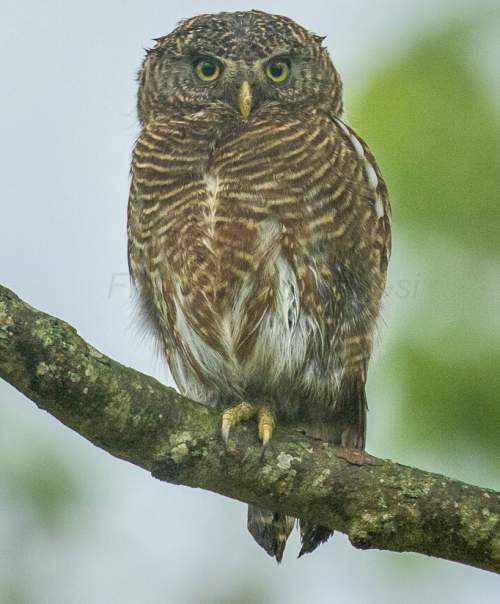 The Asian barred owlet (Glaucidium cuculoides) does not approach the thresholds for being Vulnerable either under the range size criterion, or under the population trend criterion or under the population size criterion. The IUCN (International Union for Conservation of Nature) has categorized and evaluated the owlet species and has listed it as of "Least Concern". 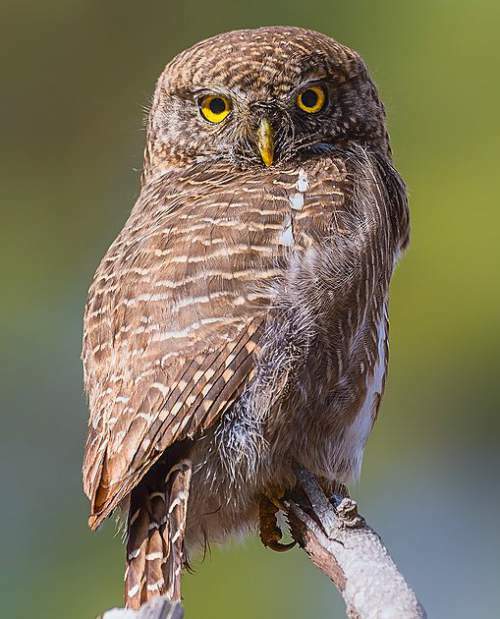 The CITES (Convention on International Trade in Endangered Species of Wild Fauna and Flora) status is ‘Not Evaluated’ for Asian barred owlet (Glaucidium cuculoides). The Asian barred owlet (Glaucidium cuculoides) is closely related to the Javan owlet (Glaucidium castanopterum). The eight recognized Asian barred owlet subspecies are: G. c. cuculoides (Vigors, 1831), G. c. deignani Ripley, 1948, G. c. austerum Ripley, 1948, G. c. delacouri Ripley, 1948, G. c. rufescens E. C. S. Baker, 1926, G. c. bruegeli (Parrot, 1908), G. c. whiteleyi (Blyth, 1867) and G. c. persimile E. J. O. Hartert, 1910. 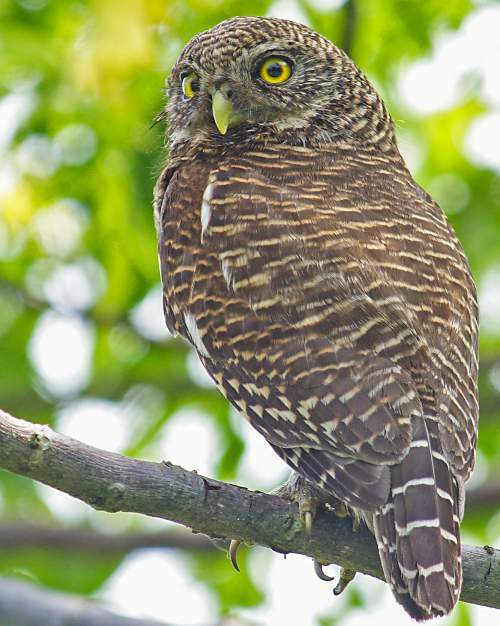 Current topic in Birds of India: Asian barred owlet - Glaucidium cuculoides.